Nexam Chemical, firmly approaching large volume orders? Nexam Chemical and Evonik – Competition or Collaboration? Anoto AB and INKWRX! INK-What??? Anoto – An Ongoing Historical Milestone Turnaround In The Swedish Micro Cap Stock Market? SinterCast – Near Future Orders in a Highly Scalable Business? EcoRub- A Brutally Undervalued Green Tech Company In An Emerging Industry? News, patent information, science and potential investment opportunities. The author has no formal education within finance. This homepage does not contain professional investment advices. The content herein is biased and the degree of truth must be checked at all times. Thus, opinions and information shall not be defined as investment advices. CESI seems genetically programmed to catch falling daggers, thus sharp stock pullbacks often results in a revised investment strategy. An interesting new Arkema patent application containing Nexamite. Nexam Chemical’s vision is to be a recognised world leader in the field of property modification of plastic and polymer materials via heat-activated crosslinking. The article ends with a milestone quote fr Nexam CEO Per Morin quote from a Redeye (video) presentation. C.E.S.I. is 100% convinced that Nexam is developing an array of ground breaking products. C.E.S.I. also claims that the CEO´s quote “For us this is almost as Losec” is an understatement in respect to scientific quality. Losec, i. e. Omeprazole, is a selective and irreversible proton pump inhibitor. It suppresses stomach acid secretion by specific inhibition of the H +/K + ATPase system. Because this enzyme system is regarded as the acid (proton, or H+) pump within the gastric mucosa, omeprazole will inhibit the final step of acid production. http://en.wikipedia.org/wiki/Omeprazole. However, the beauty is in the fine details of the chemistry! The drug Omeprazole is activated by stomach acid (by protonation of the pyridine moiety, which triggers the remaining desired cascade of events). Thus, Omeprazole should be defined as a target seeking missile. Likewise, the beauty of the Nexam cross linker is also in the fine details of the chemistry! Cross linker molecule number 1 covalently binds both the polymer and the cross linker-polymer conjugates of the cross linker molecules number 2 and number 3. 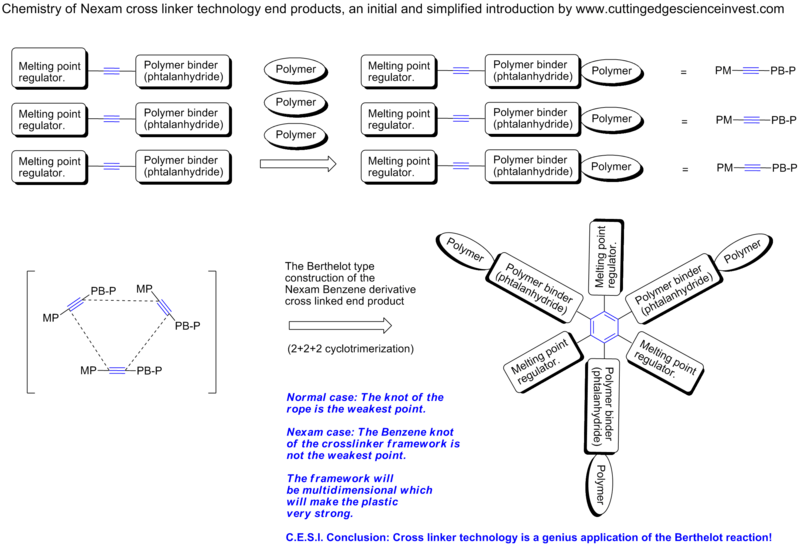 Thus, the Nexam cross linker molecules are double target seeking missiles! Thus, C.E.S.I. claims that the CEO statement “For us this is almost as Losec” is an understatement in respect to scientific quality. Both the description, the chemistry, the impact and the hidden simplicity is hard to grasp, especially for a non-chemist..
C.E.S.I. was only 99% confident that the combination of the Nexam polymers was a genius application of the historical 1866 Berthelot reaction. This key question had to be addressed, so C.E.S.I. submitted this question and this exact picture included…, to the Nexam CEO Per Morin and Daniel Röme, PhD and NEXAM Director of Business Development & Innovation. The content was much appreciated, confirmed and approved. Logically, Per and Daniel recommended C.E.S.I. to add another 4 words to the title: “A first and simplified crash course on Nexam Chemical Crosslinking perspective”. Likewise, Per and Daniel also stressed that this simplification dedicated to non-chemists was appealing (Sept 25, 2014). They recommended C.E.S.I. not to edit the early draft picture “too much” (most likely, they also wished you, the reader of the manuscripts´ final version , a few moments of laughter. 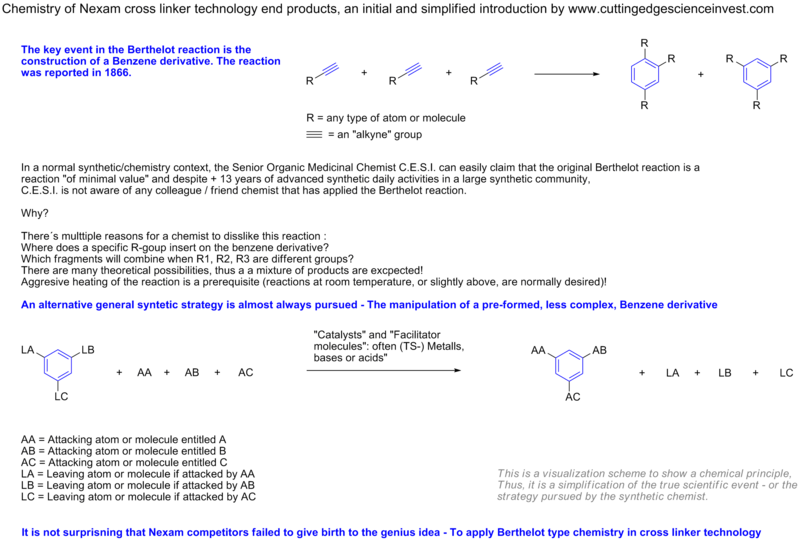 The Berthelot reaction – as such – has been ignored (and been forgotten about!) by scientific communities, presumably due to the inherent issues in other non cross-linker applications (i. e. “normal” synthetic chemistry). 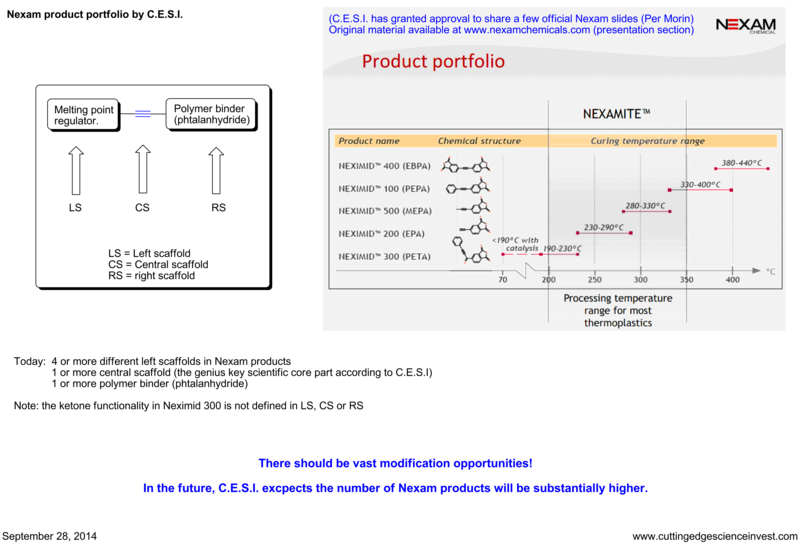 The core of the Nexam cross linker technology end-products is a Benzene derivative. 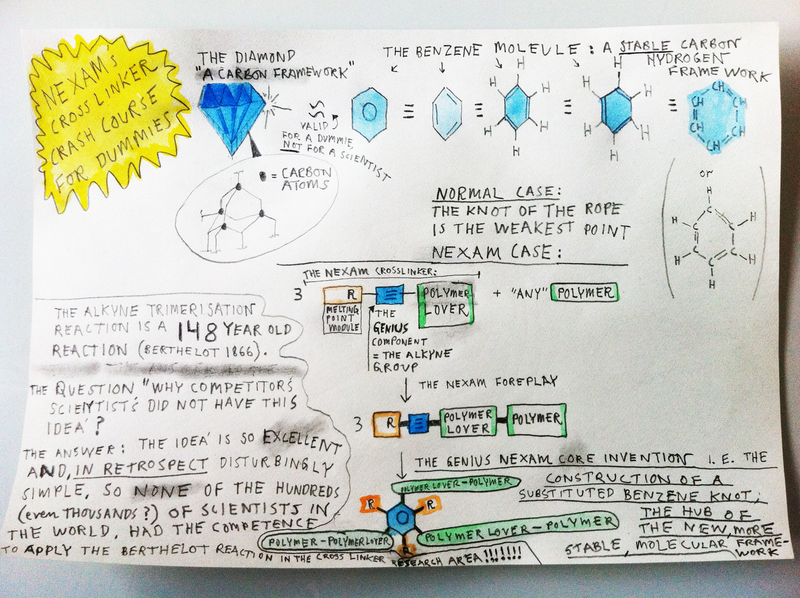 Benzene derivatives are very stable. This derivative should be a perfect central hub (=knot) in most multidimensional polymer frameworks! Nexam technology is not solely genius – It is unique! Most of the development activity and commercial use of crosslinked nylons has taken place in Europe and Asia. Sumitomo Chemicals was among the first companies that pursued crosslinked nylons. By 2005, the company had developed new radiation-crosslinking nylon 66 molding compounds, which were adapted commercially for heat-resistant electrical connectors. In late 2011, BASF (U.S. office in Florham Park, N.J.) and Sweden’s Nexam Chemical, a supplier of heat-activated crosslinkers for polymers, forged an exclusive cooperation agreement to develop and commercialize crosslinkable nylon 66 for automotive and electrical/electronic applications as initial targets. UNITIKA (http://globenewswire.com/news-release/2013/11/25/592107/0/sv/Nexam-Chemical-Holding-AB-publ-Del%C3%A5rsrapport-f%C3%B6r-kvartal-3-juli-september-2013.html?print=1) And a general link to the product pipeline: http://www.unitika.co.jp/e/products/plmr-bis/plastics.html. UPDATED Dec 8 Unitika seems to (independently) earlier have patented polyamides in combination with bisoxazolines in high tensile fibers and “higher performance products”. What is the Unitika and Nexam application? C.E.S.I. conclusion: Nexam is Nexam´s worst enemy, or? The molecules, i. e. the products, in the Nexam pipeline are extremely easy to synthesise for most chemists ( a person skilled in the art of constructing new molecules). One might argue that Nexam can produce the linkers in the most cost efficient way and this might be true today, but potentially not in the future or even near future. C.E.S.I. predicts that it would take an experienced Synthetic Chemist (e. g. C.E.S.I.) approximately 5-15 days to synthesize (= to construct) one or a few grams of cross linker material. C.E.S.I. 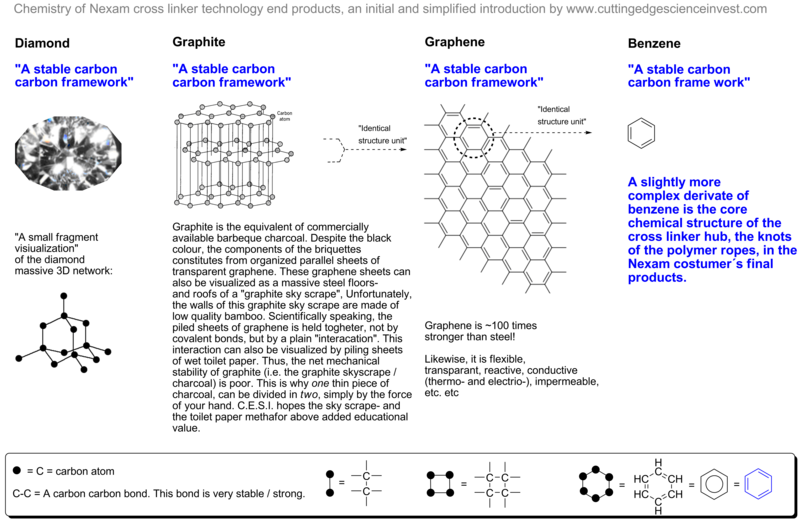 has + 13 years of experience in small scale small molecule synthesis. C.E.S.I. can not understand that a high quality process company with a vibrant creative environment should, per default, fail to copy the Nexam cross-linkers with roughly the same production cost (or even at lower production). Therefore, securing the intellectual Property (IP) must at all times be on top of Nexam´s highest priority agenda. From the massive IP press release news flow from Nexam, C.E.S.I. concludes that the Nexam CEO and the Nexam board has understood this key issue. Thus, C.E.S.I. is thrilled of excitement. Now, it seems that analysts and the market “demand” a big order from a key industry process company. Today, C.E.S.I. does not share the analyst’s and the market´s demand. C.E.S.I. would like to see even a few more “new patent press releases” prior to the announcement of the first big order. However, the recent small order announcement is a key milestone (see below). This order is a another “proof of concept” i. e. it is a solid proof that the nexam technology is not solely of academic interest… C.E.S.I. 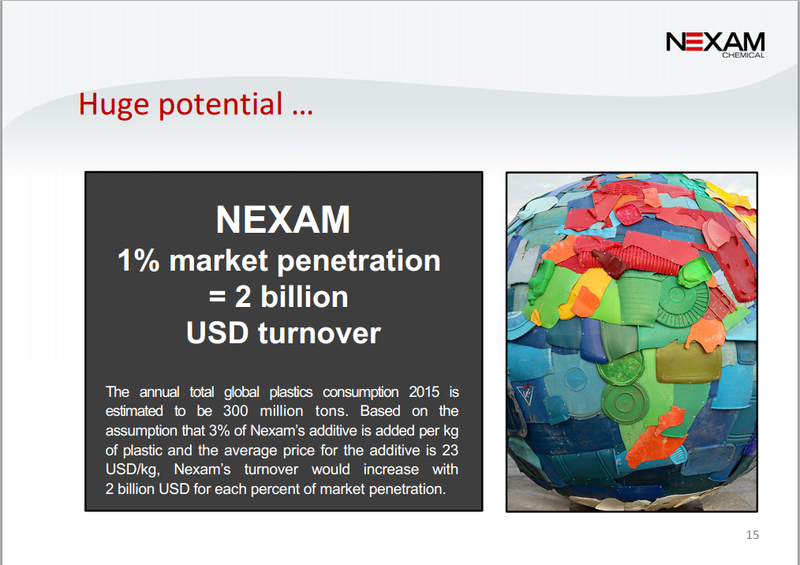 predicts that Nexam will be a key player in the next industry revolution (New superior bulk- and advanced materials). The world of plastics and polymers is wide and complex. There are tons of materials out there and only some of them can and have been optimized for use in 3D printing. So, if you were a company that produced some of the most advanced polymeric mixes out there, what would you do? You would probably do what Sweden based Nexam Chemicals just did for its PEPA Crosslinker: develop a process for using it for 3D printing with thermoplastics. Nexam is known for developing technology and products that improve the properties of polymeric materials using conventional processing equipment (i.e. extruders). Its technology is used for cross linking polymers (which in principle can consist of an unlimited number of monomers) and oligomers (which consist of only a few monomers) to create new cross linked polymers with superior properties. Controlled crosslinking can give the original polyamide enhanced properties in terms of chemical resistance and thermal/dimensional stability, make it stronger during use and make it more recyclable. It can also improve throughput and enable new processes. According to the latest Chinese patent filed in China by the Institute of Chemistry at the Chinese Academy of Sciences, that is what the Crosslinker PEPA material (aka Neximid 100) will do, by enabling new methods and new capabilities for 3D printing of polyamide thermoplastics, giving nylon properties that in certain circumstances may allow it to be used to replace metal components. And the current Nexam portfolio? There is still room for improvements. 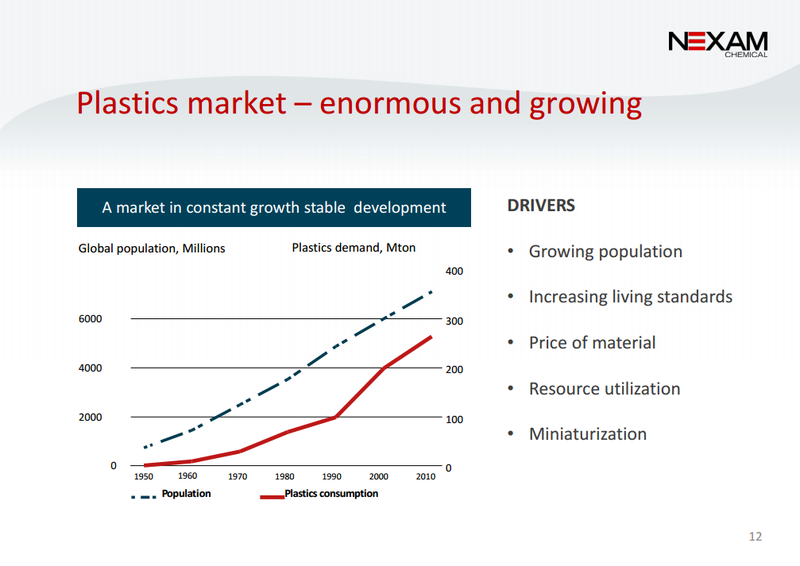 Nexam – Better plastics, Final conclusions by C.E.S.I. Last 6 months: The Nexam technology has been introduced for new world leading companies. The Nexam case is – without competition – C.E.S.I.s´ all time favorite company and investment call! A prediction of the near future share price is slightly silly and surprisingly difficult. A prediction of the 2019 year share price is also slightly silly, and also impossible. C.E.S.I. is biassed and extremely positive. Several new projects have been initiated during the quarter, mainly with European customers, and Nexam Chemical has delivered products to several of them. Our partnership with Armacell is progressing, albeit with some delays. We are also poised to begin a project funded by Eurostar that we will be working on together with Armacell and The European Van Company. The aim of the project is to upgrade recycled PET for use in PET foam and other applications. We were informed in the summer that this project will receive funding from Eurostar. In addition, many other entities in Europe are testing Nexam Chemical’s formulations mainly for upgrading recycled PET resin for various applications. Nexam Chemical entered into a cooperation agreement with its polyethylene partner IRPC over the summer for development and commercialization of modified polyolefins. IRPC has informed us that they now have passed the development phase, with respect to a polyethylene quality for pipes, and will begin testing the quality for approval together with their end client in the autumn/winter. This will be an interesting and potentially large application area for our company. Nexam Chemical held a technical launch of its new high-temperature resin, NEXIMID® MHT-R, in the beginning of October and we have already received several inquiries from around the world. In addition to the project with Rolls Royce and Swerea SiComp, we are expecting several companies to initiate projects with the new resin in the coming years. The in-depth section of this report features a fairly new area for Nexam Chemical: liquid crystalline polymers, or LCP plastics as they are often referred to. This material is rapidly gaining ground, especially in the electronics industry, where Nexam Chemical has already established itself as a supplier of products for property improvement. The author, Cutting Edge Science Invest, is a Nexam Chemical share holder. Cutting Edge Science Invest can not guarantee, or take into accountability, the content of truth and accuracy of the information in this article/post.Thus, Cutting Edge Science Invest requires that a possible reader gather complimentary information if any type of investment in the company described above is considered. Cutting Edge Science Invest provides personally biased information and at best also “general information and opinions”. The article/post does not contain professional investment advice. Wow ! That’s an impressive analysis of Nexam ! Please do your homework first! I do not aim to convince anyone! I aim to convince myself to do my homework. This homepage facilitates this action. Cheers, C.E.S.I. Its going to be a big company. Interesting analysis, these new plastics seem to be a big global trend. 1. Do Nexam make the plastics or just an additive that is sold to the plastic manufacturers? 2. Any data e.g. heat resistance, to show Nexam’s product (with the fancy chemistry) is superior? 3. Insider buying info would be interesting. Seen any? Did a quick search on avanza but no luck. 4. Their 1% market penetration seems one of those standard ‘guess-estimate goals’. More to it than that? 2 Not to C.E.S.I.s´ knowledge. However, the properties are scientifically superior, because of fundamentally reorganized molecular linkages in the polymer structure. The polymer is multi-dimensionally rigidified by the benzene derivative as the chemically and mechanically stable hub. There has been a video in one of the Nexam Chemical presentations demonstrating one excellent property. Unfortunately, I can not get this video to roll on my computer, i. e. I have not seen it. 4 C.E.S.I believes the far future 1% market penetration is an understatement. Simply seems too low. Nobody can seriously predict the near future and future market penetration. I was looking at their presentation slides to understand what competitive advantages their cross linked polymer had over others. It’s then I realised they seem to be the only ones with this technology! Really good, plus I like the fact you can potentially just add their additive to currently running manufacturing processes = low switching costs, nice! There is definitely huge upside potential with his stock IF it works on a large scale and is widely adopted. Time will tell, difficult to predict (not unusual). Looking at P/S and P/B ratios the market is already pricing in growth, how much I can’t say yet without looking into the numbers more deeply. Perhaps I am misunderstanding but wasn’t this alkyne cross coupling additive originally developed/invented by NASA in the 90’s? Either way it doesn’t matter, what is important now is Nexam has the best available and is protected by their patents. To my knowledge, the initial specific contributions was discovered by Perstorp AB and/or NASA, but the cross linker technology is still based on the 148 year old Berthelot reaction. But you are right. This is irrelevant today. Nexam is the sole IP owner! And currently, there is no competitors within this area!